This volume is a lucid and entertaining guide to the poet's craft, and an invaluable introduction to practical criticism for students. Chapters on each element of poetry offer a wide-ranging general account and end by looking at different poems, to build up sustained analytical readings. 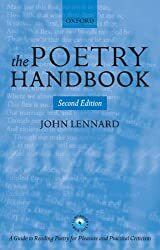 The second edition--fully revised, expanded, updated, and supported by a new companion website--confirm The Poetry Handbook as the best guide to poetry available in English.